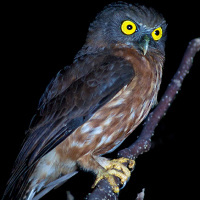 The Andaman Hawk Owl is a small to medium-sized brown owl with a rounded head and no ear-tufts. 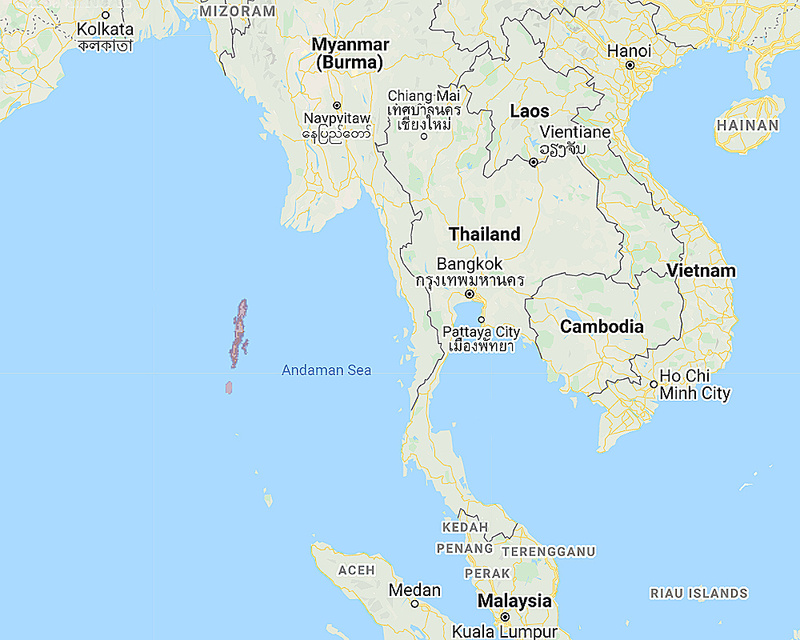 Typical call - South Andaman. © Dave Farrow. Description: The facial disc is greyish. Eyes are yellow, cere is dull green and the bill is yellowish-horn, paler on the upper ridge and tip. The crown and mantle are plain brown with indistinct fine ochre vermiculations. The mantle has a rufous tint. Upperparts are brown, with the outer webs of the scapulars having larger pale cinnamon-buffish areas. Flight and tail feathers are barred brown and buff, with the secondaries having a rufous tinge. Underparts are pale brownish-buff, streaked chestnut-brown over the entire underside - these streaks appearing as long stripes from the neck to the belly. Tarsi are feathered to the base of the toes, which a bare or sparsely bristled, and coloured yellowish. Claws are blackish-horn. Size: Length 25-28cm. Wing length 167-170mm. No weight data available. Habits: Little known, probably similar to the Brown Hawk Owl. Voice: A short, hollow, guttural, downslurred croak repeated at intervals of several seconds - crauwu. 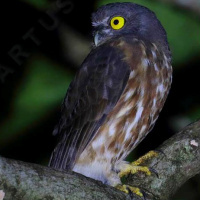 Hunting & Food: The Andaman Hawk Owl feeds mainly on insects. This owl has been observed hawking moths and beetles in flight. Breeding: The breeding biology of this owl is virtually unknown. Habitat: Mainly lowland forest. Has been observed hunting in low secondary forest. 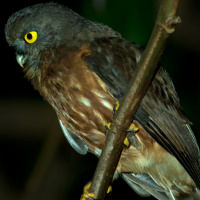 Distribution: The Andaman Hawk Owl is endemic to the Andaman Islands. Status: Probably endangered. Listed as Near-threatened by BirdLife International. Original Description: Beavan, Robert Cecil. 1867. Ibis, New Series, vol. 3, p. 316. Burton, John A.. 1984. "Owls of the world: their evolution, structure and ecology (Rev. Ed.)". Tanager Books. Page by Deane Lewis. Last updated 2016-01-12.